92nd Street Y presents the story of the human spirit at Terezín, where vibrant life and art flourished despite suffering. In 1941, Nazis established a transition camp/ghetto in Terezín/Theresienstadt, 38 miles northwest of Prague, in which great music, art and educational activity flourished despite deep suffering. 92Y presents a multidisciplinary exploration into the culture of Terezín, led by a special concert series featuring music written and performed in Terezín. To learn more about Terezín and the programs in this series and purchase tickets, visit 92Y.org/Terezin or call 212.415.5500. Order online and save 50% on service fees. 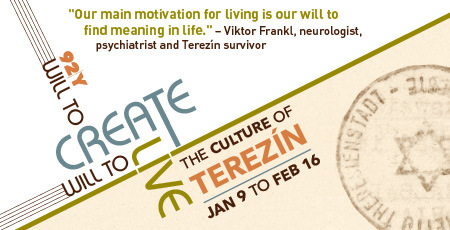 Will to Create, Will to Live: The Culture of Terezín is generously supported by The Rita Allen Foundation; and The Harold W. and Ida L. Goldstein Lecture Fund through the Estate of Sanford Goldstein.